Samantha Chase submitted this photo. I've been a member of the Spartans color guard since 2005. 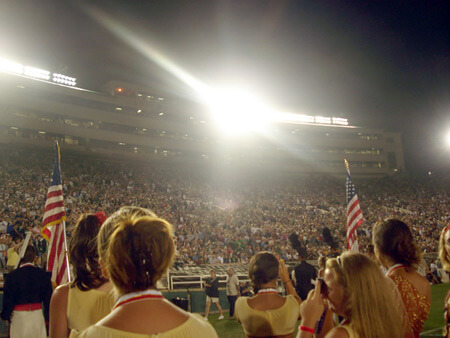 This photo was taken at Rose Bowl Stadium during the World Championship Division I retreat on Aug. 11, 2007. All that kept running through my mind was the final moment of our finals performance and how I felt walking off the field. Performing with a drum corps really is indescribable. Every year, I'm still amazed at how one simple moment can outweigh the hundreds of hours of practice while thinking "Can I really do this?" It goes to show that the best things in life take a lot of work to get to, but they're so worth it. Thanks for another great season Spartans!